William Faulkner's Nobel Prize Medal for Literature, gold medal by Erik Lundberg, with a bust of Alfred Nobel, along with information about his award, is displayed at Sotheby's in New York. the items are part of the "Fine Books and Manuscripts, Including Americana," auctioned June 11, 2013 at Sotheby's. AFP PHOTO/Don Emmert. NEW YORK (AFP).- A major auction of manuscripts and letters of American writer William Faulkner, a Nobel laureate, drew an underwhelming public response at auction in New York Tuesday, with the most important lots finding no buyer. Sotheby's had classed Tuesday's event in the Big Apple as "the largest and most important group of William Faulkner material ever to appear at auction," ahead of a second event planned for London. 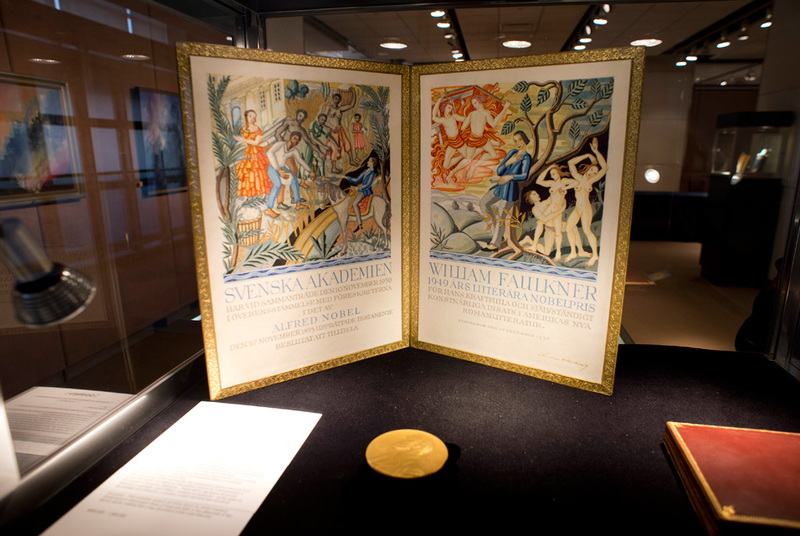 The New York auction included the Nobel Prize for Literature scroll and medal awarded to Faulkner in 1949 for "his powerful and artistically unique contribution to the modern American novel," as well as his acceptance speech. Faulker, who lived from 1897 to 1962, authored such novels as "The Sound and the Fury" (1929), and "As I Lay Dying" (1930). The price tag for the most important of the Faulkner lots -- discovered by a grandson who was cleaning out a building to make space for chickens on the family farm in Virginia -- had been estimated from $500,000-$1 million. There was no buyer. Other items up for auction were typed copies of stories, proofs of his books and letters that Faulkner wrote from Paris to his mother. That lot, worth $250,000-300,000, did not sell, either. And it was the same fate for another lot of 25 volumes of the author's works, worth an estimated $300,000-400,000. Sotheby's had taken the rare step of displaying several Faulkner items in Paris, instead of London, ahead of the New York auction, on account of the French connection. Of all the lots, 24 of 39 sold, Sothebys said.